The Springs Atrium Room hosts GGP guests for a catered stand-up dinner and an exclusive viewing of two films. “Ranching in the New Normal,” is a 12-minute Audubon production with footage of Archuleta County. Discussion is led by keynote speaker, Audubon Rockies Western Rivers Program Manager, Abby Burk. “Glen Canyon Rediscovered,” by Durango native Taylor Graham and National Geographic, follows. We must see the drop in Colorado River water in Lake Powell and Glen Canyon to understand the significant changes in southwest water resources. GGP members $25, nonmembers $50 – includes an all-access wristband for the entire Film Fest and a 2019 GGP membership. Colorado Environmental Film Festival Caravan – WATER! See Film Fest poster below and link to schedule and film descriptions. GGP wristbands receive Happy Hour half price beer and wine while we discuss WATER! Films. 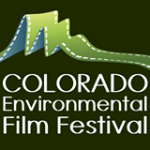 The Colorado Environmental Film Festival (CEFF) is an annual event held every February in Golden, Colorado. 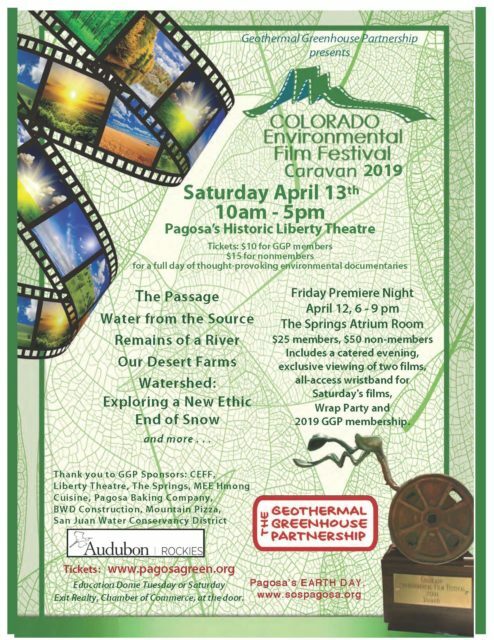 The Pagosa Springs Film Festival Caravan provides rural Coloradans an opportunity to sample the CEFF’s award-winning documentaries. In its seventh year, the Pagosa Springs Caravan is hosted at the Historic Liberty Theatre in downtown Pagosa Springs as a benefit for the Geothermal Greenhouse Partnership. Follow us on Facebook: facebook.com/geothermalgreenhousepartnership for 2019 information.